For the history of modern humans, see World history. The history of the Earth describes the most important events and fundamental stages in the development of the planet Earth from its formation to the present day. The age of the Earth is about 4.56 billion years. Nearly all branches of science have helped us understand the main events of the Earth's past. The Earth is about one third the age of the universe. A sample of gneiss from the Earth's oldest dated rocks (the Acasta River area of Canada). This sample has been dated at 4.03 billion years old, though the date has been doubted. The formation of Earth occurred as part of the formation of the Solar System. It started as a large rotating cloud of dust and gas. This cloud, the solar nebula, was composed of hydrogen and helium produced in the Big Bang, as well as heavier elements produced in supernovas. Then, about 4.68×109 years ago, the solar nebula began to contract, rotate and gain angular momentum. This may have been triggered by a star in the region exploding as a supernova, and sending a shock wave through the solar nebula. As the cloud rotated, it became a flat disc perpendicular to its axis of rotation. Most of the mass concentrated in the middle and began to heat up. Meanwhile, the rest of the disc began to break up into rings, with gravity causing matter to condense around dust particles. Small fragments collided to become larger fragments, including one collection about 150 million kilometers from the center: this would become the Earth. As the Sun condensed and heated, nuclear fusion started, and the solar wind cleared out most of the material in the disc, which had not yet condensed, into larger bodies. The Earth's relatively large natural satellite, the Moon, is unique. During the Apollo program, rocks from the Moon's surface were brought to Earth. Radiometric dating of these rocks has shown the Moon to be 4527 ± 10 million years old, about 30 to 55 million years younger than other bodies in the solar system. New evidence suggests the Moon formed even later, 4.48±0.02 Ga, or 70–110 Ma after the start of the Solar System. Another notable feature is the relatively low density of the Moon, which must mean it does not have a large metallic core, like all other terrestrial bodies in the solar system. The Moon has a bulk composition closely resembling the Earth's mantle and crust together, without the Earth's core. This has led to the giant impact hypothesis: the idea that the Moon was formed during a giant impact of the proto-Earth with another protoplanet. The impactor, sometimes named Theia, is thought to have been a little smaller than the current planet Mars. Theia finally collided with Earth about 4.533 Ga. Models reveal that when an impactor this size struck the proto-Earth at a low angle and relatively low speed (8–20 km/sec), much material from the mantles (and proto-crusts) of the proto-Earth and the impactor was ejected into space, where much of it stayed in orbit around the Earth. This material would eventually form the Moon. However, the metallic cores of the impactor would have sunk through the Earth's mantle to fuse with the Earth's core, depleting the Moon of metallic material. The giant impact hypothesis thus explains the Moon's abnormal composition. The ejecta in orbit around the Earth could have condensed into a single body within a couple of weeks. Under the influence of its own gravity, the ejected material became a more spherical body: the Moon. 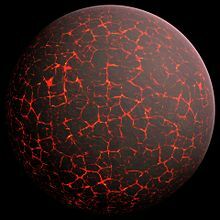 The radiometric ages show the Earth existed already for at least 10 million years before the impact, enough time to allow for differentiation of the Earth's primitive mantle and core. Then, when the impact occurred, only material from the mantle was ejected, leaving the Earth's core of heavy elements untouched. The impact had some important consequences for the young Earth. It released an enormous amount of energy, causing both the Earth and Moon to be completely molten. Immediately after the impact, the Earth's mantle was vigorously convecting, the surface was a large magma ocean. The planet's first atmosphere must have been completely blown away by the enormous amount of energy released. The impact is also thought to have changed Earth’s axis to produce the large 23.5° axial tilt that is responsible for Earth’s seasons (a simple, ideal model of the planets’ origins would have axial tilts of 0° with no recognizable seasons). It may also have sped up Earth’s rotation. The Archean atmosphere apparently lacked free oxygen. Temperatures appear to have been near modern levels, although astronomers think that the sun was about one-third dimmer. This is thought to reflect larger amounts of greenhouse gases than later in Earth history. Geologic map of North America, color-coded by age. The reds and pinks indicate rock from the Archean. Fossils of cyanobacterial mats (stromatolites) are found throughout the Archean—becoming especially common late in the eon—while a few other probable bacterial fossils are known from chert beds.p307 In addition to bacteria, microfossils of the extremophilic archaea have also been identified. There are no known eukaryote fossils.p306, 323 No fossil evidence yet exists for viruses. Classically, the boundary between the Proterozoic and the Paleozoic was set at the base of the Cambrian period when the first fossils of animals known as trilobites appeared. In the second half of the 20th century, a number of fossil forms have been found in Proterozoic rocks, but the boundary of the Proterozoic has remained fixed at the base of the Cambrian—currently placed at 542 Ma. The Paleozoic covers the time from the first appearance of abundant, hard-shelled fossils to the time when the continents were beginning to be dominated by large, relatively sophisticated reptiles and relatively modern plants. The upper (youngest) boundary is set at a major extinction event 250 million years later, known as the Permian–Triassic extinction event. Modern practice sets the older boundary at the first appearance of a distinctive trace fossil called Phycodes pedum. Geologically, the Paleozoic starts shortly after the breakup of a supercontinent called Rodinia and at the end of a global ice age (Snowball Earth). Throughout the early Palaeozoic, the Earth's landmass was broken up into a substantial number of relatively small continents. Toward the end of the era, the continents gathered together into a supercontinent called Pangaea, which included most of the Earth's land area. At the start of the era, life was confined to bacteria, algae, sponges and a variety of somewhat enigmatic forms known collectively as the Ediacaran fauna. A large number of body plans appeared nearly simultaneously at the start of the era—a phenomenon known as the Cambrian Explosion. There is some evidence that simple life may already have invaded the land at the start of the Palaeozoic, but substantial plants and animals did not take to the land until the Silurian and did not thrive until the Devonian. Although primitive vertebrates are known near the start of the Palaeozoic, animal forms were dominated by invertebrates until the mid-Palaeozoic. Fish populations exploded in the Devonian. During the late Palaeozoic, great forests of primitive plants thrived on land forming the great coal beds of Europe and eastern North America. By the end of the era, the first large, sophisticated reptiles and the first modern plants (conifers) had developed. The Mesozoic covers the time when life was dominated by large sophisticated reptiles. The lower (oldest) boundary is set by the P/Tr extinction event. The upper (youngest) boundary is set at the K/T extinction event. Geologically, the Mesozoic starts with almost all the Earth's land collected into a supercontinent called Pangaea. During the era, Pangaea split into the northern continent Laurasia and the southern continent Gondwana. Laurasia then split into North America and Eurasia. Gondwana broke up progressively into continents: South America, Africa, Madagascar, India, Australia and Antarctica. The Mesozoic is known as the Age of Dinosaurs. It also saw the development of early birds and mammals and, later, flowering plants (angiosperms). At the end of the Mesozoic, all the major body plans of modern life were in place, though in some cases – notably the mammals – the forms that existed at the end of the Cretaceous were relatively primitive. The Cenozoic is the age of mammals. During the Cenozoic, mammals diverged from a few small, simple, generalized forms into a diverse collection of terrestrial, marine, and flying animals. Flowering plants and birds also evolved substantially in the Cenozoic . Geologically, the Cenozoic is the era when continents moved into their current positions. Africa and Australasia split from Gondwana to drift north, and India collided with Southeast Asia; Antarctica moved into its current position over the South Pole; the Atlantic Ocean widened and, late in the era, South America became attached to North America. ↑ Dalrymple, G. Brent 2004. Ancient Earth, ancient skies: the age of Earth and its cosmic surroundings. Stanford. ↑ Bowring, Samuel A.; Williams, Ian S. (1999). "Priscoan (4.00-4.03 Ga) orthogneisses from northwestern Canada". Contributions to Mineralogy and Petrology 134: 3. doi:10.1007/s004100050465. ↑ The Earth's Moon is larger relative to its planet than any other satellite in the solar system. Pluto's satellite Charon is relatively larger, but Pluto is considered a dwarf planet. ↑ Kleine et al. 2005. Hf-W chronometry of lunar metals and the age and early differentiation of the Moon. Science 310, 1671–1674. ↑ Halliday A.N. 2006. The origin of the Earth; what's new? Elements 2 205-210. ↑ Halliday, Alex N 2008. A young Moon-forming giant impact at 70–110 million years accompanied by late-stage mixing, core formation and degassing of the Earth. Philosophical Transactions of the Royal Society. 366, 4163-4181. doi:10.1098/rsta.2008.0209. http://rsta.royalsocietypublishing.org/content/366/1883/4163.full. ↑ Ida S. Canup R.M. & Stewart G.M. 1997. Lunar accretion from an impact-generated disk, Nature 389, 353-357. ↑ Münker, Carsten et al. 2003. Evolution of planetary cores and the Earth-Moon system from Nb/Ta systematics. Science 301 (5629): 84–87. doi:10.1126/science.1084662. PMID 12843390. http://sciencemag.org/cgi/content/abstract/301/5629/84. ↑ Liu L-G. 1992. Chemical composition of the Earth after the giant impact. Earth, Moon, and Planets 57, 85-97. ↑ Newsom H.E. & Taylor S.R. 1989. Geochemical implications of the formation of the Moon by a single giant impact. Nature 338, 29-34. ↑ Benz W. & Cameron A.G.W. 1990. Terrestrial effects of the giant impact. LPI Conference on the Origin of the Earth, 61-67. ↑ 13.00 13.01 13.02 13.03 13.04 13.05 13.06 13.07 13.08 13.09 13.10 13.11 13.12 Stanley S.M. 2008. Earth system history. Freeman, San Francisco. This page was last changed on 21 February 2018, at 15:35.